PHOTO: Gade Neymar, Jwè Bezil la, ki ap Kriye - Kisa li genyen? Haitians only have two teams: Argentine and Brezil, It's like the Republicans and Democrats in US Politics, it there not in the game; it's game over! France knock out Argentina 4-3 sending Lionel MESSI home. 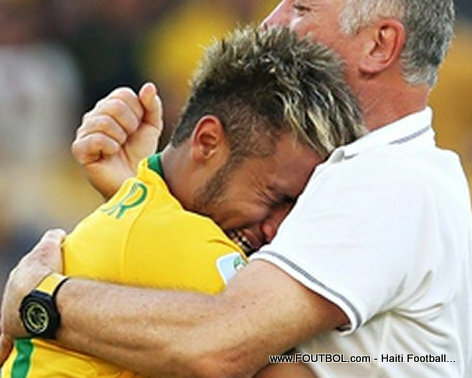 Earlier today Belgium eliminated Brazil 2-1 sending NEYMAR da Silva packing. Ask any Haitian soccer fan, the World cup is over in Haiti. Jah and Jahnes love. In my humble opinion, no good standing Ayiti person should be careful which Country they support in the FiFA World Cup. I feel justified in throwing my energy behind the France Soccer team because there are lotsa of Black players who are of African descent. I am sorry that Brazil and Argentina have been eliminated but we'll go on. Ayiti people should now look to the Teams that are left, because the Game is ON and Paris is LIT. Congrats to the Bleus and to the Red Devils.